Writer finds his balance on a log — one baby step at a time. Blue Ox Log Rolling owner and instructor, Sarah Beron, helps writer Stuart Sudak get his lake legs. Standing knee-deep in water on a warm August day, I ready myself to step out of my comfort zone and onto a log. Lured by a heart-pumping workout that tests stamina and grit, the throwback sport of log rolling is gaining in popularity among non-lumberjack types. I’m nervous. The closest I’ve been to log rolling is when, as a child, I crawled on my hands and knees across a fallen tree. Balance, sadly, has never been my strength. For beginner log rollers like myself, three training fins—one in the middle and one on each end—help slow the rotation down on the synthetic logs Beron uses. Indeed, I need all three fins. She offers a few more tips. “Move your feet fast straight up and down,” she says. “Don’t try to rotate the log. Try to stay balanced on top.” I try again. The splash is inevitable but comes a little later than the first, then the second and the third. Baby steps, I tell myself. I’m breathing hard. It’s a good workout. “You can keep going, or take a break?” she asks. “One more time,” I say. “Oh, there’s the classic one more time,” she says. Life is a balancing act. Beron is a whiz at balance, on or off her feet. The 36-year-old Victoria resident’s adeptly juggles many roles: wife, mother, teacher and, more recently, business owner and avid log roller. “For me, it just fits together so seamlessly that it doesn’t feel like a matter of balance at all,” she says. 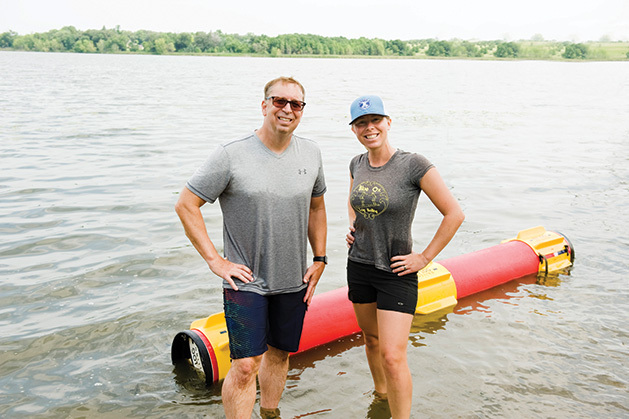 Beron says her teaching skills (she’s a math teacher at her alma mater, Minnetonka High School), her family (she and her husband, Nolan, have two daughters, Nora, 7, and Elsa, 6) and her favorite workout form the foundation for her business, Blue Ox Log Rolling. “Log rolling and being a small business owner fills me with so much joy. It makes me a better wife, mother and teacher,” she says. As owner and lead instructor of Blue Ox, she’s been teaching people of all ages how to log roll for fun, exercise and sport since May 2016. She considers it a family business. Summer lessons take place in the Beron’s backyard on Lake Auburn, and Nolan, a building superintendent for Ryan Companies, also teaches lessons, designed the logo and serves as the all-around handyman. Whether the setting is a classroom or lake, teaching is Beron’s passion. During the summer, Beron offers classes and an adult league night, as well as log rolling-themed events like birthday or corporate parties. She also takes the logs and an inflatable pool on the road to breweries and the Minnesota State Fair. The log rolling doesn’t end for her when the weather turns cold. Beron teaches the sport at Minnetonka Middle School West in Excelsior on most Saturdays from September to June through Minnetonka Community Education. 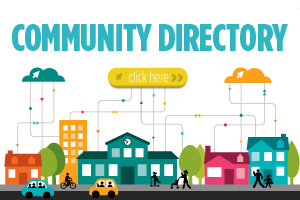 And, she serves as the advisor for both the Minnetonka middle and high schools’ log rolling clubs. She especially likes teaching adults something they’ve never done before. “It makes them feel like kids again,” she says. Though always fascinated with log rolling, Beron didn’t step onto a log until January 2016, at an open demonstration hosted by Key Log Rolling, a Minnesota-based business that makes synthetic logs. After that, she was hooked. Abby Delaney, co-founder and president of Key Log, says Beron was a natural log roller from the start. “It’s really cool to see what she’s done and how many people in the Minnetonka area that she has introduced to the sport through her classes,” Delaney says. A sport that sprouted from the great river log drives of the late 1800s is gaining a foothold among weekend warriors. Log rolling—where a person tests their mettle and balance on a log either solo or against someone else—is gaining traction for its fitness benefits. One reason for its popularity is the synthetic log Key Log Rolling has been selling since 2013. According to its website, Delaney’s favorite sport didn’t have modern equipment, so she made it herself. In the water, the synthetic logs have the same density and movements as a 500-pound cedar wood log. However, most of its weight is in water. Once drained, the synthetic logs weigh 65 pounds, making it easier to bring to a lake or pool. Delaney hopes her logs can propel the sport into the Olympics someday. “We have the same type of equipment for everyone, so there is consistency, and that’s a big deal to make it into the Olympics,” she says.